5 feet for communication wires (cable TV, phone, fiber optic cables, etc.). The clearances are the sum of three separate components. In order to calculate the required clearance, you must add together the reference component, mechanical component, and electrical component. The mechanical and electrical component are constant. The mechanical component is 2.0 feet and the electrical component is 2.5 feet. The reference component changes depending on the type of cable or conductor and activity below or adjacent to the electrical wire. Common reference components include: roadways, driveways, sidewalks, buildings, and billboards. Clearances of electrical lines should be measured at the lowest point of sag. The sag refers to the vertical distance between the highest and lowest point of the wire’s curve. An overhead powerline that otherwise meets clearance standards in normal temperatures may no longer meet the required clearance in extreme temperatures or with additional load, such as ice. Therefore, the NESC requires that clearances be maintained at the worst case scenarios of 32°F with ice loading to 120°F. If you see a low-hanging electrical line over a road, you should contact the utility company responsible for the line. 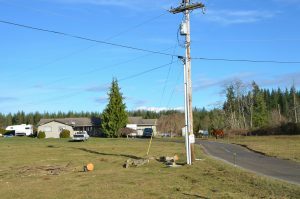 The utility company can safely raise the height of the powerline to meet clearance requirements. You should assume all electrical lines are live and should never attempt to pass under an overhead electrical line that appears too low. A utility company or third party could be liable if an electrical line running across a roadway causes injury or damage because it was hanging too low and did not meet clearance regulations. If you were in an accident involving an overhead powerline line, you should call the experienced personal injury attorneys at Kraft Davies. You may be entitled to certain damages or compensation. Please call our office at (206) 624-8844 or contact us through this website.